Join the Georgia Conservancy for an incredible weekend of caving, hiking, camping, live music and all-around outdoor adventure at Cloudland Canyon State Park. Cloudland Canyon is located on the western edge of Lookout Mountain and was formed as Sitton Gulch Creek cut its way into the surrounding sandstone. The canyon’s elevation ranges from 800 feet at the floor to 1,980 feet at the rim. 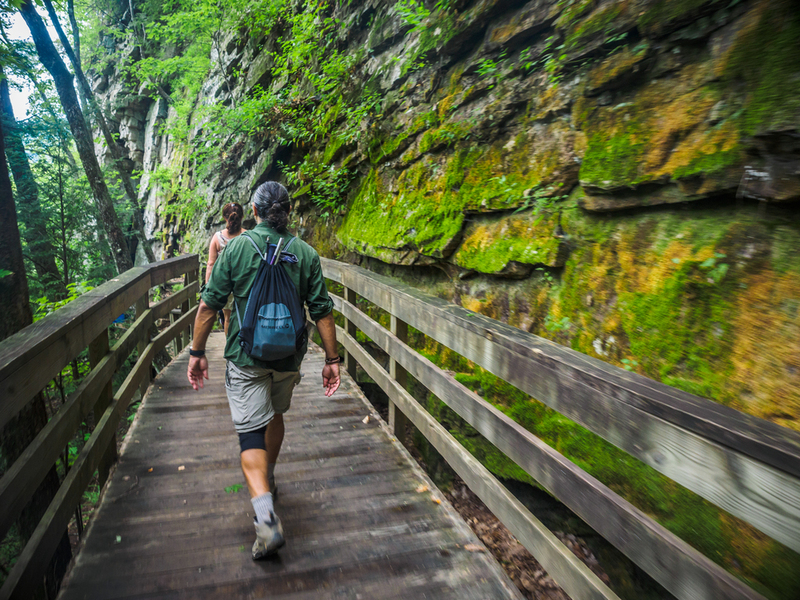 Cloudland Canyon offers scenic walks and challenging hikes, including a trail leading to two cascading waterfalls, Cherokee Falls and Hemlock Falls. Guests on our Cloudland Canyon Adventure Weekend can choose between primitive camping, a rustic “summer camp style” bunkhouse (four rooms of bunk beds, two gender specific rooms and two co-ed rooms), and Canyon-side cabins! 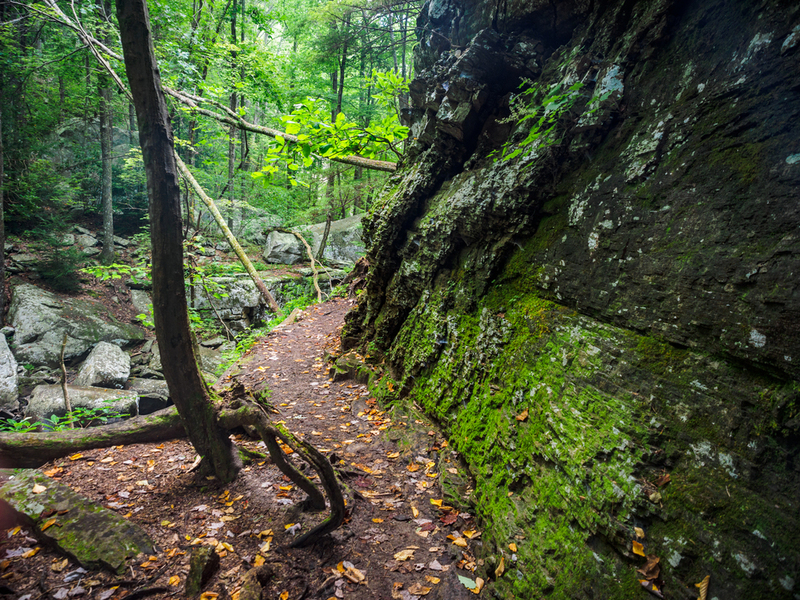 Friday afternoon - Those arriving early on Friday will have the opportunity to join a private guided hike/tour of nearby Lula Lake Land Trust at 2 PM before settling in at Cloudland Canyon, just a 20 min. drive away. Lula Lake Land Trust is one of the most stunning conserved landscapes in all of the Southeast and offers visitors a number of incredible waterfall experiences and vistas atop Lookout Mountain. The guided tour will begin at 2:15 PM and will last roughly 1.5 - 2 hours. We do suggest at $10 donation to the LLLT for those wishing to join the hike. Additional details will be emailed to registrants before the Cloudland Canyon Weekend. Check-in for the weekend offically begins at 3 PM (and will continue into the evening) at Cloudland Canyon State Park at our reserved Group Lodge. Guests will have the opportunity to settle in, relax, take self-guided hikes, and enjoy our happy hour before our brief interpretive presentation from State Park staff and a delicious dinner. Campfire time is not to be missed! Saturday - Guests will have the opportunity to choose from a number of guided and self-guided activities on Saturday. Another activity available is mountain biking or hiking on the new 5 Points Recreation Area and the Cloudland Connector Trails (this activity will not be organized or guided by GC staff, but maps will be provided). Sunday - Check-out for all guests (campers, cabin, lodge) is 11 AM, but a number of activities still remain! For those who missed out on Friday's private tour of Lula Lake Land Trust, the property will be open to the public on Sunday beginning at 12 PM. Get there early! GC will lead a morning a hike along the Sitton's Gulch Trail for those who are interested. 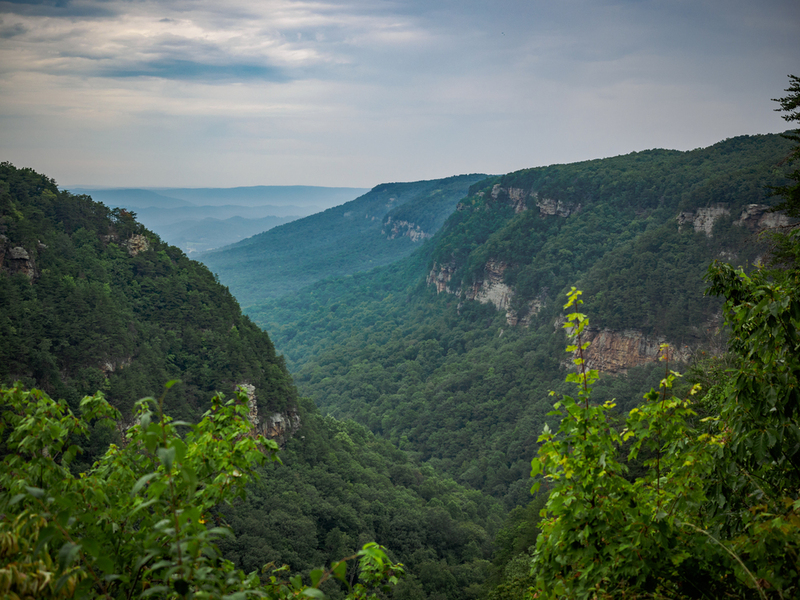 Guests are encourage to strike out on their own and explore areas of Cloudland Canyon State Park (and its new 5 Points Recreation Area) that they may have missed earlier in the weekend. All meals (Friday evening - Sunday morning) are provided during this trip. Guests are highly encouraged to bring additional personal snacks or beverages. Local Georgia in-kind sponsors/donors for the weekend include: Cafe Campesino Roastery, ASW Distillery, and Sweetwater Brewing Company. By participating in one of our Stewardship Trips, you are helping to support our year-round and statewide advocacy for the protection and conservation of Georgia's natural resources. Did you know? Georgia Conservancy members have the opportunity to register early for select Stewardship Trips, as well as receive a discount on a number of our adventures during the year. Become a Georgia Conservancy member today, or renew your membership Already a member? Use your email provided promo code for early registration and to receive a discount (Live Oak Level and above) when registering for this trip. Participants who choose to camp have unlimited access to our REI sponsored Gear Bank which includes tents, sleeping pads, backpacks, and flashlights for a one-time fee of $5. Using your account ID #, Georgia Conservancy members (Live Oak level and above) will receive a $5 discount (which makes it free) for the Gear Bank Access. The Cloudland Adventure Weekend is one of our Bucket List Adventure Trips. Our Bucket List Trips are once-in-a-lifetime journeys that include adventures in the Cohutta Wilderness, Okefenokee Wilderness, Blackbeard Island Wilderness, Cabretta Beach on Sapelo Island, Cloudland Canyon, Jeykll Island and on the Conasauga River. If you have any questions about our Stewardship Trips Program or about any upcoming trip, please contact Georgia Conservancy Stewardship Trips Director Clark Harrison at charrison@gaconservancy.org.